Our Spray Dodgers are manufactured from an uncoated heavy Acrylic canvas to ensure a long lasting hood with excellent UV resistance yet looks similar from both inside and outside the boat. The acrylic canvas is available in a large range of colours. Each dodger needs to be patterned individually as every boat is different and it should not be assumed the port side is a mirror of the starboard side. If the boat is local to us we will visit the boat and measure up for you or you could fill in the attached measurement form. The form can be used on a PC or iPad / iPhone and typed directly onto and saved and then emailed back to us. 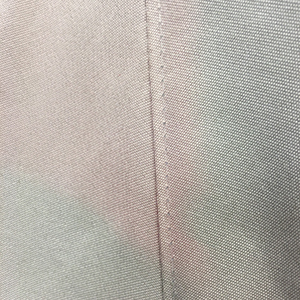 Anti-wick thread which swells up when wet to make the cover water proof or an option to upgrade of thread to ‘Tenara’, guaranteed for 15 years, almost impervious to UV degradation so perfect for use in high UV areas, acid rain and other pollutants, however ‘Tenara’ is not an anti-wick thread so it can leak in big downpours. 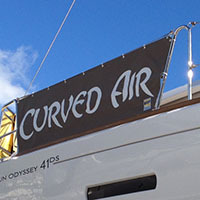 Boat name lettering to a standard font or for a modest increase a stylised font of your choice. 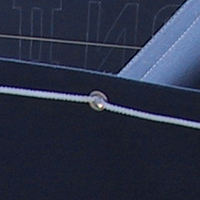 Includes grommets along the top and the sides to lace to the stanchions and guardrails. Cut outs for spinnaker sheet blocks or other deck fittings.